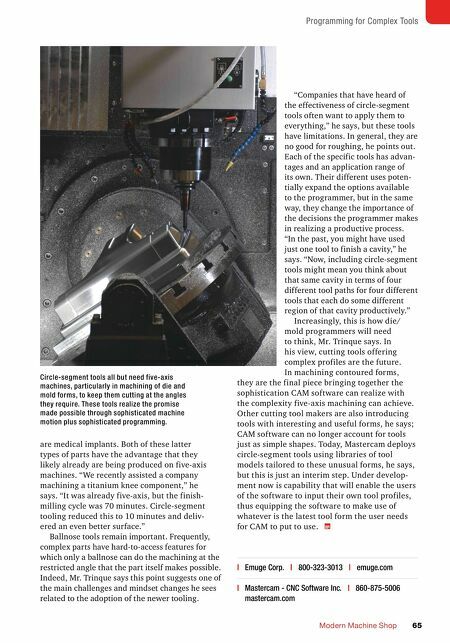 MMS JUNE 2018 64 mmsonline.com CAD/CAM SOFTWARE to be held at just the correct angle so that the large-radius profile comes into play. What angle? Mr. Trinque says the tool with an oval form is limited to a 15-degree range of motion at which the tool is effective. The taper-form tool is far more limited than this; its angle of engagement cannot vary by more than 0.1 degree. The ballnose, by contrast, is effectively unlimited in its range of motion. 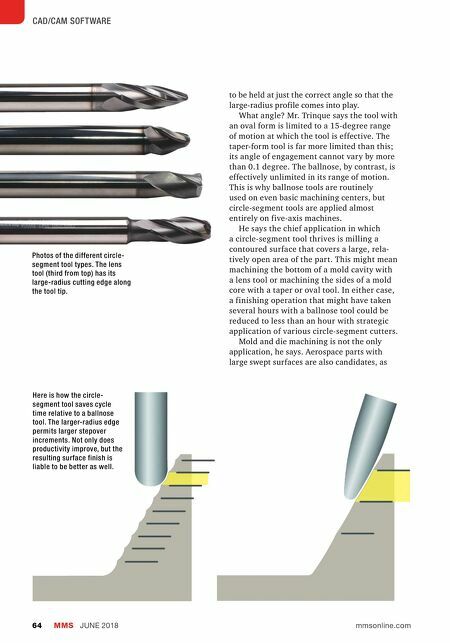 This is why ballnose tools are routinely used on even basic machining centers, but circle-segment tools are applied almost entirely on five-axis machines. He says the chief application in which a circle-segment tool thrives is milling a contoured surface that covers a large, rela- tively open area of the part. This might mean machining the bottom of a mold cavity with a lens tool or machining the sides of a mold core with a taper or oval tool. In either case, a finishing operation that might have taken several hours with a ballnose tool could be reduced to less than an hour with strategic application of various circle-segment cutters. Mold and die machining is not the only application, he says. Aerospace parts with large swept surfaces are also candidates, as Here is how the circle- segment tool saves cycle time relative to a ballnose tool. The larger-radius edge permits larger stepover increments. Not only does productivity improve, but the resulting surface finish is liable to be better as well. Photos of the different circle- segment tool types. The lens tool (third from top) has its large-radius cutting edge along the tool tip.